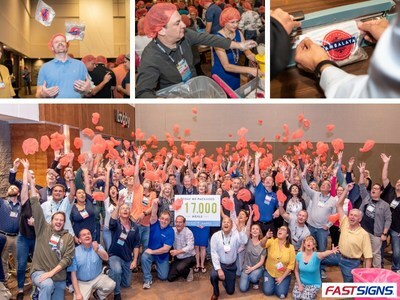 CARROLLTON, Texas, Feb. 13, 2019 /PRNewswire/ -- FASTSIGNS® franchisees and their employees, vendors and FASTSIGNS International, Inc. corporate staff participated in a "FASTSIGNS Community Giveback" by assembling 17,000 meals for local children and their families with the organization, Feeding Children Everywhere. This event occurred during the 2019 FASTSIGNS International Convention held January 16-19 in Orlando, Florida. "Through our FASTSIGNS Community Giveback Projects, our meeting attendees and vendors come together to support a local cause and make a positive impact in the cities that host our events," said Tracy Lake, Director of Events at FASTSIGNS International, Inc. "We are so grateful for organizations that work to end hunger. With the help of our partners in giving, we were honored to join Feeding Children Everywhere to help make a dent in hunger for Orlando and the surrounding areas." Under the direction of Feeding Children Everywhere leadership, attendees measured, weighed, packaged and boxed 17,000 meals by forming 14 assembly lines. This was accomplished in 30 minutes during the FASTSIGNS Community Giveback Breakfast with a Purpose event. "Our partners not only provide meals, they provide hope," said Sarah Davila, Public Relations Manager at Feeding Children Everywhere. "Our event with FASTSIGNS created the opportunity to impact hundreds of families struggling with hunger in Orlando. Together we were able to provide 17,000 meals to children and families in need." This event was also made possible by the generous support of the FASTSIGNS Community Giveback sponsors including Vista System, swissQprint, peerhatch, Ornamental Post & Panel, Click2Sell, Digital Designed Solutions, Banner Ups, Computerized Cutters, Inc. and N. Glantz & Son. Feeding Children Everywhere, based in Orlando, Florida, is committed to providing healthy meals to those in need, sustainability and making contributions matter. Creating a hunger-free world will be possible if we have an awareness of our impact on the world around us. Feeding Children Everywhere has implemented sustainability goals to reduce their carbon footprint to eliminate the utilization of harmful plastics as well as helping to create self-sufficient and sustainable communities throughout program areas. Financial efficiency and meaningful impact are the pillars of their commitment as they believe that financial transparency combined with a high-energy, tangible impact volunteer experience is the key to a contribution that makes a meaningful difference.